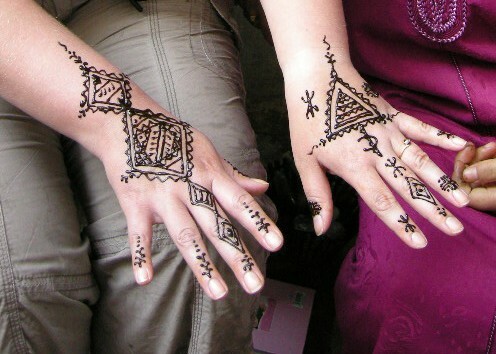 Where does henna hand painting originate? The use of henna for decoration in Morocco goes back to the time when the Berbers first migrated into the area; they were long settled there when the Phoenicians and the Romans invaded North Africa. No one is certain of the Berber's origins, but it is generally believed that they came from either Yemen or the area what is now Syria. Berber henna symbols reflect aspects of their lives connecting their art to nature. Planting, harvesting, reference of the sun, moon, earth and the stars are all included in the symbols of the Berber's early cultural traditions and are carried on even today. Such symbols are not only for decoration but also for protection from the evil eye and from the evil spirits believed to dwell in the surrounding trees and brooks. When I was having this traditional Berber design done I was told by the lady that this would bring me Baraka. Baraka is used to deal with the darker forces at large throughout life helping to cure illnesses and protecting oneself against the evil jnoun (spirits - the source of the English word "genie") and the evil eye. Berber symbols are included in the design of everyday objects to protect the object as well as the person who uses or wears it. In my case she said this would bring me luck with a man after I answered that I had no husband. These motifs appear in all aspects of the Berber artisanal tradition, including pottery, leatherwork and textiles and all types of personal adornment. It makes sense then that Berber found many ways to adorn themselves with jewellery, tattoos and henna. It is mostly Berber women who are tattooed. Many Berber women in Morocco have found other outlets for placing their protective motifs by including them in textiles they weave and in their jewellery and henna designs. The designs that are drawn in henna on the hands and feet of a bride on the eve of her marriage are these same protective and nurturing symbols that have evolved throughout centuries of following this tradition. I also learned, when out in Morocco, that the tattoo is just as significant as the designs themselves. I was told that Berber women are often tattooed around body openings to keep the jnoun from entering the body through them. The feet are adorned with protective symbols to keep the jnoun (genie) from coming into the body through the earth. Designs near breasts and pubic areas enhance sensuality. Designs on the back prevent infertility and treat it. Designs on ankles or hands protect the person from the evil eye as well as lending lightness and delicacy to the body. The symbol on the end of my left index finger is the Berber sign of freedom. My other fingers are dressed with Snake and fish skeletons. The snake represents a holy person and also has many magical and medicinal properties. I should put that on my CV. The triangular chessboard design on my left hand is associated with dizzy spells and celestial experiences, perhaps symbolic of religious trances. I am up for that! The diamond symbol on my right middle finger is the Eye which is for protection against the evil eye; the cross in the middle deflects evil in four directions. My favourite henna decoration I had when I was in Morocco was the black Berber design I had done in Essaouira. I paid c £16 for the design in the photo.